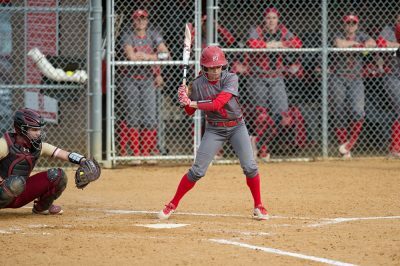 The Boston University softball team will play a three-game weekend series against Lehigh University at the BU Softball Field beginning Saturday afternoon. This will be the first time the Terriers (18-16, 2-1 Patriot League) host a Patriot League matchup on their home field during the 2018 season. BU has won 10 of its last 12 games, defeated only by crosstown rival Boston College and the United States Military Academy in game two of a three-game series. BU head coach Ashley Waters said although the Terriers did not perform as well as they wanted, they hope to build upon their strong start when they take on Lehigh. Following last weekend’s games against Army (12-19, 3-3 Patriot League), the Terriers’ 2-1 Patriot League record currently places them third in the Patriot League while Lehigh (10-17, 5-1 Patriot League) is currently in first. The Mountain Hawks lost their second Patriot League game against Colgate University, but won the first and third against the Raiders (5-21, 1-2 Patriot League) and swept three games against Lafayette College over the weekend by a combined score of 13-2. Lehigh is also coming off an 8-6 win over Fordham University in a Wednesday night contest that went eight innings. Fordham (15-17) knotted the score up at six with two runs in the seventh, but a home run to left field from sophomore infielder Mary-Hannah Smith in the extra frame propelled the Mountain Hawks over the Rams. The last time the Terriers and Mountain Hawks played was in the 2017 Patriot League final. In both game one and game two, Lehigh defeated BU by one run, with scores of 1-0 and 4-3, respectively. In the 2016 Patriot League semifinals, BU defeated the Mountain Hawks to move on to the finals. However, over the past three seasons, BU’s regular-season record against Lehigh is 1-7. To prepare for this weekend, Waters said that the team focused on offensive drills. “Going into this weekend, our strings are even better so we’re more confident at the plate and we can generate more runs,” Waters said. This will also be the only weekend the Terriers and Mountain Hawks will play each other during the 2018 regular season. Lehigh has won five of its last six games, four of them having been Patriot League wins, and will look to build off last season’s playoff run. In 2017, the Mountain Hawks won their 14th conference title, and received an automatic bid into the NCAA Tournament. Their postseason run ended quickly after falling to both the No. 5 University of California, Los Angeles and California State University, Fullerton in the opening round of the tournament. Senior outfielder Nicole Yozzo leads Lehigh offensively by a significant margin, as she has six more hits than any other teammate. Yozzo’s .333 batting average is fourth in the Patriot League, and she is joined by two Terriers in the top five. Senior outfielder Emma Wong is one spot above Yozzo, batting .358 on the season and junior catcher Alex Heinen is second in the league with a .365 average. After playing the Mountain Hawks this weekend, BU will play a two-game series versus Central Connecticut State University before its next three-game Patriot League matchup, which will take place at the College of the Holy Cross. The Terriers has already played Central Connecticut State (11-18) once this season, beating the Blue Devils 6-2 in the Nor’easter Invitational. BU will play 12 of their next 17 games on its home field in Boston, and Waters said that this home field advantage is important to the team.